Hello my lovelies! I have been busy pottering away this morning, twiddling and fiddling with loose ends here and there and finally everything is in place for my Pretty Peggy Garland. As well as the wee pattern in Issue 5 of Spoonful I now have a more comprehensive version available as a pdf download in my wee Etsy shop and on my Ravelry pages - yay! "Let me introduce you to Miss Peggy, possibly the loveliest garland to ever come from my wee hook… ! At least if you are anything like me you will think so, because if you are anything like me then you will obviously love all things crochet, have a huge stash of pretty vintage buttons stashed away somewhere and will adore anything that uses such kitschy granny chic colours… ! This pattern is great for beginners who want to try crocheting flowers for the first time, as it is a simple pattern using the basic crochet stitches. A basic diagram is included with a chart for both UK and US terms." Oh, and better still why don't we have a wee giveaway!? Now I know each and every one of you out there will have your very own button stash. Be it large or small, vintage or not. Organised by colour, size, material or age. Or like mine, just randomly jumbled together in several different pots all around my wee studio! Thing is you get to see my buttons quite regularly on my lovely ladies, so now it's your turn to show me! Over the next week I would love it if you guys could take a wee snap of your button stash and either blog it or post it on your Flickr pages for example. Basically post it somewhere we can all see it then pop back here and leave a wee comment with the link, easy peasy! And the giveaway - this time next week I shall figure some way of choosing three of the most fabulous button collections and the owners of said collections will receive a free copy of my Pretty Peggy Garland pdf. - Please only post your entries / links in the comment thread of this post, entries / links posted elsewhere will not be eligible. - Please ensure that you leave a way for me to contact you directly in the event you are chosen as a winner, preferably a current and valid e-mail address. If there is no way to contact you, you will not be eligible to win. - I will contact the winners directly and place an announcement on this blog. If I do not hear back from the winner within three days I will choose an alternative winner for this giveaway. - This giveaway is open to everyone worldwide. - I will choose the winners myself (in some way) and all decisions are final. I hope you all have a fabulous day and have fun with your buttons... ! Well, I don't have a button stash to share so just wanted to say how beautiful this garland is! I love your picture, you look sort of trapped by this flowery web! Will need to start crocheting soon, there's so many cute things to make. Miss Peggy is the loveliest garland I've seen lately. I've just stumbled across your blog. It's LOVELY!! 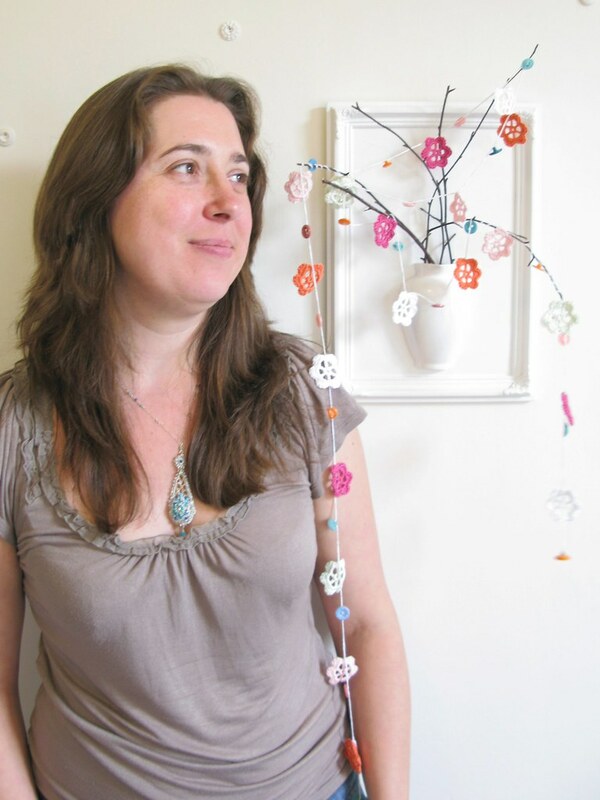 I love your garland...and well done for being featured in Spoonful! I've sgined up to follow you! 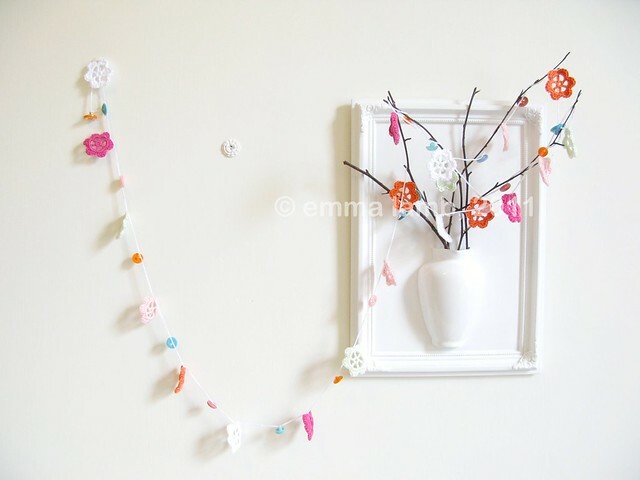 Thanks - I have been hoping you would do a garland pdf pattern - I will definitely be making this! My button stash is only wee and disappointingly modern (so far) but I did blog about it: Buttons! I will have to read the post right after this comment is posted, cause I just had to do it on the spot! I adore your new garland, the styling you made and your lovely selfie! I'd heard on the grapevine (twitter) how beautiful your garlands were...they were so true. 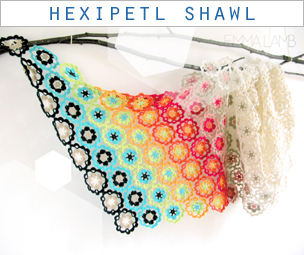 OOh a giveaway and for one of your very beautiful garlands. 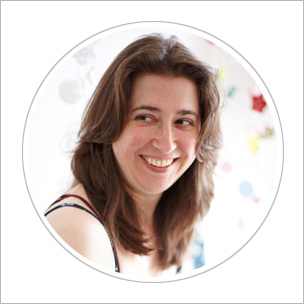 I have been looking at your blog for a while now but have never really been confident enough to actually leave a comment on how beautiful your site and products are. What a lovely little garland! 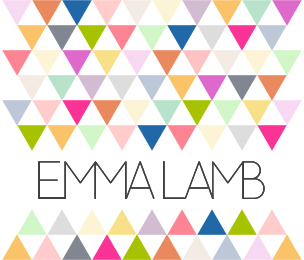 Hi Emma - Love your blog, always inspirational. That is super cute.. I love the idea of the 3D esque vase..
Just thought I would include some buttons from my mother's button tin. Even the little plastic leaf lives in her tin. They all go back a long way, the only one I can date is the pink fabric covered button which is from my mother's wedding dress, she and my father were married in June 1944!